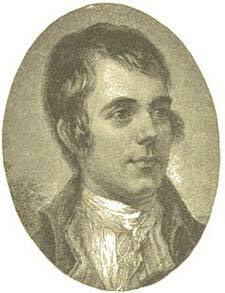 Robert Burns, the great lyric poet of Scotland, was born January 25, 1759, near the sea coast town of Ayr. His father, William Burness, had all he could do to support a family of children, of whom Robert was the eldest. The boy soon became a stalwart toiler and could turn a furrow and reap a swath with the best of his comrades; but his mind meanwhile grasped strongly and passionately all the literature to which it could get access. This was limited in extent; the books in his father's humble cottage were very few. He devoured, besides, everything in prose and verse that he could buy or borrow; and there were soon aroused in him all the longings of repressed genius and unemployed ambition. Many of Burns's poems have had music set to them; but he began his rhythmical career by fitting poetry to music. A girl friend often worked beside him in the fields, as was the custom in that locality. She was a beautiful songstress, or at least seemed so to the untutored peasant-boy, and Robert soon learned to put new words to many of her tunes, not forgetting to include in them due commendations of the young lady herself. These efforts naturally received more or less applause; and the youth found his mind more and more drawn toward poetic effort. His first few years seem to have been spent in a half-happy, half-careless boyhood; in them he had all the experiences of a poor but healthy Scotch peasant-lad, toiling in the fields, catching now and then a few weeks or months at school, coquetting with neighboring lasses, but with poverty and lack of social position always barring the way to his advancement. Through all this, poetry was his solace and amusement; at the age of fifteen he had written many verses which, although crude, contained the promise of his subsequent career; but of course at that time they were admired only by a limited circle of his neighbors and friends. He also unhappily contracted certain convivial habits, which lasted in a greater or less degree all through his life, which no one regretted more than he did at times, and which greatly impaired and finally put an early end to a brilliant career. When Robert was twenty-five years old his father, the good William Burness, died, and the family, who had kept well together, took a farm about eight miles distant from the old home, near Ayr. Here the young farmer-poet undertook to become a thorough and industrious husbandman. He turned his attention toward the literature of the farm; he tried to bend his powerful though dreamy mind toward the prosaic and the practical. But the venture did not thrive; some of the thousand-and-one casualties that are always besetting crops and crop-growers came his way, and the brave venture which he and his brother Gilbert had undertaken together, proved scant of success. He, however, may be said to have done the greatest work of his life upon that farm. It was while one day weeding the "kailyard," or garden, with his brother, that he first decided, after they had talked it carefully over, to be an author, and to write verses that would "bear publishing." It is to be noticed that from this hour he became more methodical with his muse and seemed to work toward a purpose; and that within a short time after this resolve he wrote most of the poems that have made his name immortal. In 1786 it was definitely decided that the farm was not going "to pay," and that his efforts as an agriculturist had failed. But these were not the only troubles that were gathering in the young poet's path. In 1785 he became engaged to his "Highland Mary." If we may judge by his poems, this was the one among his numerous love affairs in which his heart was most deeply enthralled; but there was another in which he was inextricably and fatally entangled. It was with a young girl, Jean Armour, to whom he seems to have been as sincerely attached as his headlong, susceptible nature would allow him to be to anyone. He made the best amends he could to "the bonnie lass" by giving her his written acknowledgment of marriage--a process perfectly legal in Scotland, though irregular--but her father still hoped for a more advantageous alliance for his daughter, and refused her to the poor poet; a sentiment in which the daughter, to all appearances, heartily joined. It is interesting to think of this poverty-stricken family rejecting Burns, even after matters had gone thus far, on account of his lack of wealth, when he had at that very time, in his little desk, poems for which the world has since paid millions of pounds. But the future is often unseen, even by those highest in learning and deepest in wit; and it is little wonder that the unsophisticated family were unable to know even the pecuniary value of our young ploughman's brain. Discouraged and depressed the young poet resolved on emigrating to Jamaica, as book-keeper of a wealthy planter. In order to procure the money with which to pay the expenses of his journey, and no doubt partly in pursuance of the plan made that day in the garden, he decided to publish a small volume, by subscription, which he did, at Kilmarnock, in July, 1786, having as the title-page of the book, "Poems, Chiefly in the Scottish Dialect; by Robert Burns." It will be seen that he now dropped the fifth and sixth letters from the name inherited of his father, and the boy Burness became the man Burns. This book achieved immediate and unexpected success; and having realized a few pounds from its profits, Burns set out for Greenock, where he was to take ship for his new West Indian home. But his poems had attracted so much attention, and had been the cause of such commendation, that he was finally encouraged to stay and enjoy some of the fruits of his genius, which the world was now beginning to discover. In November of the same year, encouraged by verbal praises and written commendations, some of them all the way from the literary centre of Edinburgh, he journeyed to that city, where he was received with great cordiality by many of the leading people, and urged to issue a second edition of his poems, which he did in April of the ensuing year. It was sold, like the first one, by subscription, and netted the author a much larger sum; while it procured him fame, all through the country, as "The Ploughman Poet." During this year he took several tours in different parts of his native Scotland, in company with congenial spirits, once going a very little way into England. He was received gladly and hospitably everywhere by those who had read and admired his poems. His journals and letters during that period, probably upon the whole the most happy in his life, teem with accounts of courtesies, hospitalities, merry-makings, and gallantries, which he mentions as taking place all along the route. His poetic pen never seems to have remained idle very long at a time; and albums, fly-leaves, note-books, letters, and sometimes windowpanes, received in turn his quaint and fiery verses. In October he returned to Edinburgh, where he remained for some time, filling social engagements, entangling himself in certain affairs of the heart, and endeavoring to get a settlement with his publisher, whom he considered as owing him the immediate payment of a considerable sum of money. He also assisted a compiler in making collections of old Scottish songs, and in furnishing new words to old airs. It is a singular fact, that while Burns was willing to earn money with the regular edition of his poems, he steadfastly declined remuneration for his songs, claiming that he did the work for love. With the natural Scotch thrift of his fathers, he soon decided that he must have some more substantial occupation than that of a poet, and he applied for and received a position in the Excise. To add to his income he, in 1788, leased a farm on the river Nith, about twelve miles from Dumfries. The place contained one hundred acres, and was stated to be "more the choice of a poet than of a farmer." Its fine situation and beautiful views compensated, perhaps, in Burns's mind, for its sterility. Here he brought his wife, Jean Armour, whom he had married under such unpleasant circumstances a few years before, and to whom he was drawn again as much by pity as by love, her parents having turned her out of doors. It is hardly necessary to say that the parents received him with open arms, now that he came with some signs of prosperity; and he no doubt entered anew upon married life with their sincere, if somewhat tardy, blessing. Upon this farm of "Ellisland" Burns lived three years, and during that time he had three occupations--farmer, poet, and excise officer. In the last-named he was in the habit of riding two hundred miles per week, to different points throughout the county. He wrote considerably, but perhaps not so well as if he had not been hurried and worried by practical affairs. As an officer he is generally admitted to have been thorough, correct, and at the same time humane; as a farmer, he again failed, and in 1791 sold back the lease of his place, pocketed, it is said, a loss of #300, and moved with his family to Dumfries. Here he took up the plan of living entirely upon his salary from the Government--#70 per annum. This would seem a meagre stipend now; but it would at that time have enabled Burns to support his family in comfort, though not in the way his abilities entitled him to do. His position gave him some perquisites, and he had the hope of an advance in his salary, which would follow a looked-for promotion to the office of supervisor. He spent his time in the performance of his duties, in collecting and writing songs for the above-mentioned compilation of Scottish melodies, and in meeting and conversing with the many friends whom his genius and geniality drew around him. But his hopes and his health gradually failed together. Dumfries was on one of the great stage lines that led to and from London, and it was often invaded by tourists who were intent on "making a night of it" with the well-known peasant-poet. In these bouts, in which he was generally willing to recite his poems and sing his songs, he received much pleasure and applause, but nothing else, save the wear and tear of dissipation. His habit of outspoken opinion, in political and other matters, proved obstacles to his advancement in the public service; he fell gradually into debt, despondency, and disease--a mournful trio of companions for the most brilliant of Scottish poets! "An old man before his time," he lay down to die, in 1796, having lived, as time is counted, only thirty-seven short years. The fame of this great and unfortunate poet has increased since his death; Scotchmen everywhere thrill with pride when Burns's magic name is spoken, and the world in general has a sincere love for the warm-hearted, plain-spoken bard, who turned his own soul to the gaze of his fellow-beings, that they might the better know their own. The space of this article will not permit even an enumeration of his wonderful poems; the world may almost be said to know them by heart. His "Cotter's Saturday Night," "Tam O'Shanter," "Bonnie Doon," "Auld Lang Syne," "Bruce's Address," "A Man's a Man for a' That," and many others that might be named, are likely to live for generation after generation; and his character as a man, although subject in many respects to severe criticism, can always be covered with a mantle of loving charity, when we remember his generosity of heart, his manly independence of spirit, his natural nobility of mind, and consider the difficult circumstances and terrible temptations that encompassed his stormy life.